In order to implement more or less realistic bouncing it is not enough to have only positions and bounding boxes of colliding objects. You need to have some kind of kinematic history: to be able to tell how objects move after collision you should also know how they were moving before the collision. In simplest case, you want to have at least a velocity (speed) vector (direction and magnitude) and, probably, a mass for every object. When collision is detected you may simply invert the direction of the velocity vector of one of the objects (for example, smaller and lighter one). This would not look very realistic, but is very simple to implement. For more realism you could use momentum conservation principle or elastic collisions. For even more realistic bouncing, implement acceleration vector and re-calculate both, velocity and acceleration after collision is detected. Having acceleration you may now add arbitrary forces influencing your objects (gravity, friction, maybe even electromagnetic forces etc.). Adding more attributes make it more interesting: for example adding elasticity and viscosity may be used to calculate deformations. As you see there is more in object interactions involved than just positions. Additionally, collision detection and bouncing code could (and should) be decoupled. That means that you would want to implement them in different parts of code (different set of functions and classes): collision subsystem will detect the collision event, providing information like: whether collision happened or not and if yes, by how far objects currently intersect with each other. After that, bouncing code, based on this information, will decide how to change objects traveling, while deformation code will decide how to change objects shapes etc. Thus, there will be no silly problems like which "if" statement in collision code came first decides the direction of bouncing. Finally, you should know that DirectX 9 API is wildly obsolete, not supported and should not be used for new projects. It is notoriously hard to port D3DX* stuff to modern APIs. You may want to take a look at DirectX 11 and OpenGL 4, along with their support library ecosystems, or maybe even a good rendering or game engine. Specifically you may want to use some good math library (with vectors, matrices, linear algebra, geometry). I would also add Real-Time Rendering and Real-Time Collision Detection to the list of absolutely essential game development books. 12pm - I can't think of any immediately obvious, simple, way to do this in iOS. I'd look around for a package and if you're lucky there will be one! Otherwise it's just a case of plain hard programming. You may possibly have to use beziers (Find the tangent of a point on a cubic bezier curve (on an iPhone)) to define the travel path. Or maybe, "simply" two half-circles. From there use a "normal" slider concept to get the X position of the finger, but just position the "y" value of the red ball, per your equations. That will work OK.
For a better approach (I doubt it will be necessary), the NEXT more complicated approach is: ALSO note the Y value of the finger. WHEN THE FINGER IS NEAR the "difficult" parts", THEN INSTEAD consider the Y value. Do you see what I mean? However, IMO it would be "thoughtless engineering" .. .solution "A" or "B" is typically perfect! The concept of interval notation comes up in both Mathematics and Computer Science. The Mathematical notation [, ], (, ) denotes the domain (or range) of an interval. This side of the interval is open. An interval with mixed states is called "half-open". How does this relate to Mathematics and Computer Science? Mathematics tends to be one-based. These differences can lead to subtle fence post errors, aka, off-by-one bugs when implementing Mathematical algorithms such as for-loops. Some programming languages, in contradistinction, would refer to the first element as the zero'th relative element. Since the array indexes are in the range [0,N-1] then for clarity purposes it would be "nice" to keep the same numerical value for the range 0 .. N instead of adding textual noise such as a -1 bias. Mathematicians, since they start counting at 1, would instead use the i = 1, i <= N nomenclature but now we need to correct the array offset in a zero-based language. Interval notation is also important for floating-point numbers to avoid subtle bugs. When dealing with floating-point numbers especially in Computer Graphics (color conversion, computational geometry, animation easing/blending, etc.) often times normalized numbers are used. That is, numbers between 0.0 and 1.0. Some implementations of a random number generator, random() may produce values in the range 0.0 .. 0.999... instead of the more convenient 0.0 .. 1.0. Proper comments in the code will document this as [0.0,1.0) or [0.0,1.0] so there is no ambiguity as to the usage. You want to generate random() colors. You convert three floating-point values to unsigned 8-bit values to generate a 24-bit pixel with red, green, and blue channels respectively. Depending on the interval output by random() you may end up with near-white (254,254,254) or white (255,255,255). For more details about floating-point precision and robustness with intervals see Christer Ericson's Real-Time Collision Detection, Chapter 11 Numerical Robustness, Section 11.3 Robust Floating-Point Usage. Not really a website, but this book Real-Time Collision Detection is well worth it for what you are looking for. 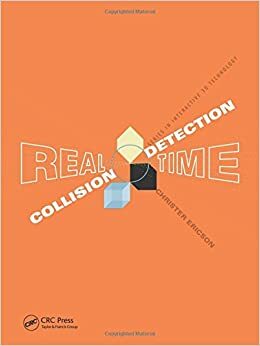 If you get the chance you should really check out the Collision Detection bible, "Real Time Collision Detection" if you plan on doing anything non-trivial. I'm not a professional game programmer and I understood and could apply the concepts in it with little trouble. Basically, doing a set of line intersection tests is expensive no matter what. What you do is use things like Bounding Boxes (axis aligned or oriented) over your complex polygons. This will allow you to quickly do a worst case O(N^2) check of collision between each "object". You can then speed things up even further by using spatial trees (Binary Partitioning or QuadTrees) by only checking intersections of objects close to eachother. This allows you to prune many, many collision tests. The best optimization is not doing something at all. Only once you have a collision between bounding boxes do you do your expensive line intersections to determine if the objects truly do intersect or not. This allows you to scale the number of objects up while still keeping the speed reasonable. Real-Time Collision Detection by Christer Ericson could be a good choice for you since it covers many basic geometry intersection tests. Take a look at its table of contents.